The Saljuqnama is a historical work written around AD 1188 for Tughril III, the last of the Saljuq dynasty to rule in Iran. Zahir al-Din Nishapuri hoped to win favour at the court by presenting his history of the great early Saljuq kings and their less powerful successors in Western Iran to the young Sultan. Written in an accessible style, with a leavening of entertaining anecdotes, the history has fourteen brief chapters covering the rise of the dynasty and the reigns of individual Sultans. Though often quite inaccurate, this work was the main source on the history of the dynasty available to later Persian chroniclers. The identification of the apparently unique manuscript in the library of the Royal Asiatic Society of Great Britain and Ireland has made it possible to produce this edition of the long-lost work. 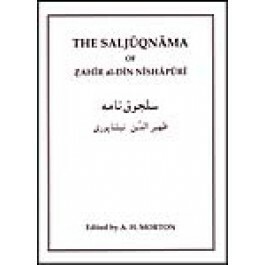 Although the manuscript provides the basis of the edition, much evidence for the text of the original is available in the works of later historians who made use of the Saljuqnama. This evidence has enabled Morton to check and correct the readings of the manuscript, and to produce a text which rests to a great extent on lost manuscripts of the Saljuqnama which were in existence a few decades after the composition of the original. Morton's introduction provides a discussion of the history of the text, the author and his work, orthography and editorial procedures, and a vocabulary of unusual words.